The variety of video file formats and wide range of gadgets reproducing these video files has contributed to the emergence of numerous programs that convert video from one format to another. At the same time developers of such software go in two ways: either “sharpen” their product to convert specific formats, or they try to create a universal converter that can create video for different gadgets. What makes Freemake one of the best solutions for working on video is its user-friendly interface and multiple options for video converting and editing. Besides the conversion feature it’s possible to create high quality slideshows, extract soundtracks from movies and edit video. Preparing media files for playing on different devices with this software is a piece of cake. First of all download the program following the link above and install it on your PC or laptop. The software can run on Windows Vista, Win 7, 8, and Windows 10. Win XP is no longer supported. During the installation the software might ask you if you want to integrate all media files with Freemake. If you are OK with it, continue the installation process. If you want to keep your default player, deselect this option. 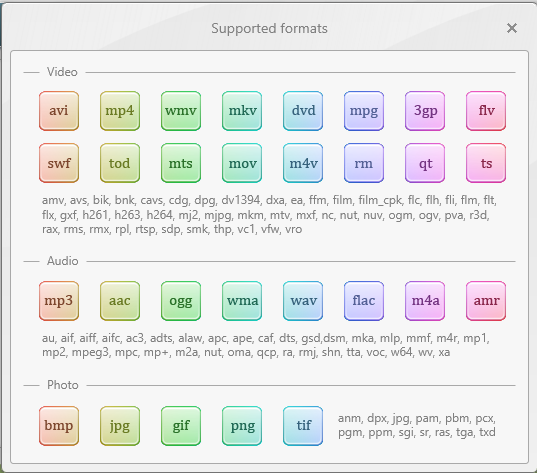 Consider the process of converting video files into one of the most popular formats: AVI format. On the toolbar with large buttons click the “Video” button and search for the desired video file. The selected file is displayed on a wide strip (let’s call it informational) in the central part of the window. The developers have put into the program several presets with typical parameters for them. After opening the list of profiles, we will find the presets they offer for mobile devices, DVD, etc. Thus, if, for example, you plan to view the video on a DVD player in the future, you can select “DVD Quality” from the list. But this option does not always suit you because DVD player may simply not be able to play video with such parameters, which entails the need to change them. To create your preset click the button “Add your preset” (green cross). If you need to change the preset conversion settings click the “Edit preset” button (blue gear). 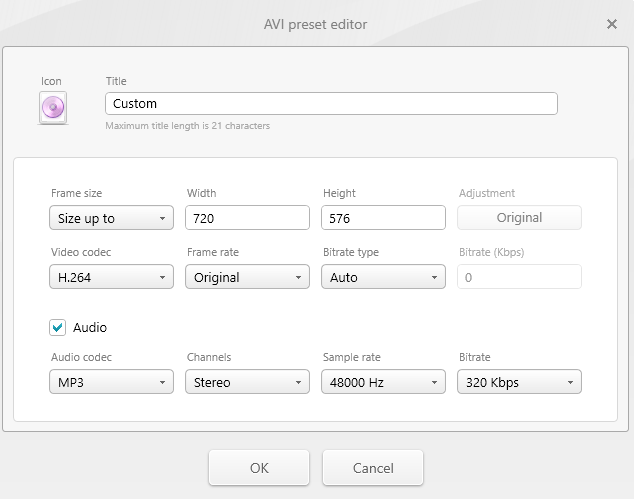 In either case the preset editor window appears where you can specify parameters for both video and audio. You can change any of the conversion options, both by selecting from the list and by typing from the keyboard. In the “Save to” field select the destination of the output file if you want to change it. Click the button “Convert” and wait till conversion process is done. The process of conversion is quite fast. This is largely due to the built-in support for NVIDIA CUDA technology allowing to add to the video conversion process all the computational resources of the video card which makes the conversion process very fast. The program also provides ready presets to convert video for gadgets such as iPod, iPhone, iPad, PSP, Blackberry, Xbox, Nokia, Samsung, Android. For example, to convert your video at one of Apple supported formats, simply click the “+Video” button to add all the video files that you want to convert to your gadget. Then choose “to Apple” green bubble (the 3d one) on the formats panel. Choose your device model from a drop-down menu. As was mentioned above, Freemake Video Converter has a number of useful features that can be used along with the conversion process or as self-contained function. For example it is very easy to combine several files into one. To do this in the central window with the files select files using the standard combination, that is, click on the information lines with the video names while holding down the <Ctrl> key, then click the button located in the upper right corner. The location of the files in the window will change slightly. Combined files will be placed together under the common information line where summary information about these files will be displayed: the total viewing time and the accompanying inscription “Transitions off”. Separating merged files is even easier. In the same place on the toolbar click the right button. A valuable feature of the program is the availability of a tool that allows you to cut out unnecessary fragments from the video. This is how it is done. Use the slider and the “Play”, “Step Forward” and “Step Back” buttons to move to the beginning of the segment you want to cut out. In the Crop area click the “Start Selection” button. Go to the end of the fragment you will to cut and click the “Selection End” button. Click the “Cut Selection” button. Click the “OK” button and return to the main window. Convert the gotten video fragment. There are dozens of programs for downloading multimedia content from the Internet. But again, these are, as a rule, independent utilities. The developers of Freemake Video Converter included this option directly in the program itself. Downloading is very simple and can be performed right from the interface of the software. Once the link is selected, copy it and click the “Paste URL” button at the toolbar, and then perform the actions for converting the file. You can download not only video files, but also slide shows and audio files. The list of sites from which you can download content is pretty decent: YouTube, Vimeo, Vevo, Dailymotion, etc. You can see the list of sites by clicking Help> Supported sites. In this article only basic functions of Freemake Video Converter were reviewed, but the program also allows you to add subtitles, create slideshows and music visualizations, extract audio in MP3 format from video files as well as convert audio files into this format. As a bottom line, Freemake Video Converter is a great utility for all those who need a good converter to prepare videos for all types of gadgets or edit the video. It can do almost everything you need and even more.